In the past, I have demonstrated several projects and features for OpenShift, Red Hat’s Platform as a Service product. You may be aware of OpenShift Online, available at http://openshift.com, for seamless deployment of applications to the cloud. What you may not be aware is that OpenShift Online is only one of the OpenShift products available. The OpenShift line of products features 3 solutions: Online, Origin and Enterprise. While OpenShift Online may suit your public cloud needs, there may be interest in establishing a private or hybrid cloud solution within your enterprise. The best way to become familiar with a product is to install and configure it yourself on a local machine, such as a personal desktop or laptop. Evaluating cloud-based technologies on a single machine typically requires the use of virtual machines to replicate multiple machines or environments. However, applying the appropriate configurations when leveraging multiple virtual machines can be challenging as they must be able to communicate both with each other as well as the external Internet. 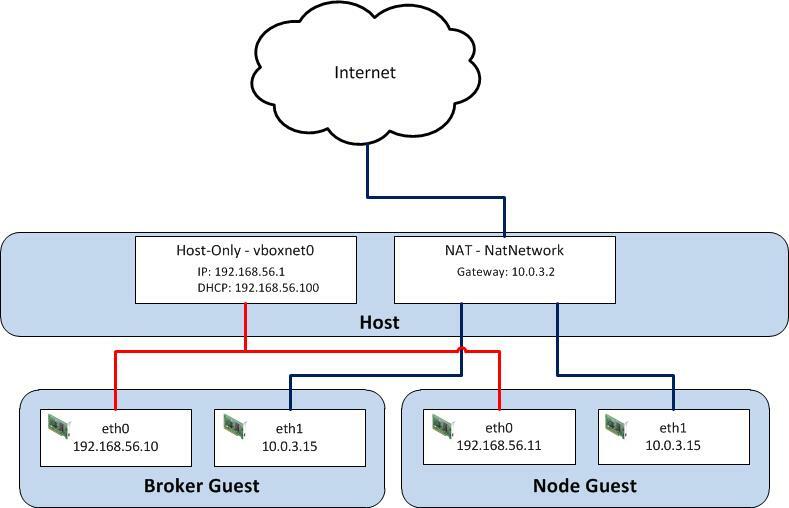 In the following discussion, we will walk through the process of configuring the supporting infrastructure of a minimal installation of a private OpenShift environment using Oracle VirtualBox. VirtualBox, similar to most virtualization software, supports several network hardware devices that can be run in a variety of networking modes. A full discussion of the different types of network devices and modes VirtualBox can be configured in can be found on the VirtualBox website . To accommodate the aforementioned requirements, we will leverage multiple network adapters running in separate networking modes. The first adapter will be configured in host-only mode as it creates a private network among each virtual machine configured with this network type and the host. The limitation when running in host-only mode is there is no access to external resources such as the Internet. To allow access to external networks within each guest, a second adapter is configured in NAT networking mode. NAT networking is one of the modes VirtualBox provides for allowing a guest to connect to external resources. It was chosen as it requires the least amount of work and configuration by the end user and is ideal for simple access to external systems. An overall diagram of the virtual machine network architecture can be found below.